This K&M Camera Bundle comes with All Standard Fuji Supplied Accessories + 1 Year Fuji Limited Warranty. 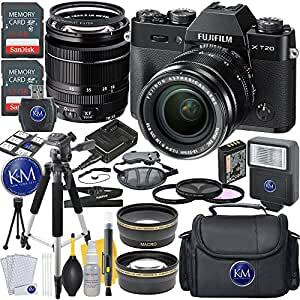 Camera Box Includes: Fujifilm X-T20 Mirrorless Digital Camera (Black), XF 18-55mm f/2.8-4 R LM OIS Zoom Lens , NP-W126S Li-Ion Battery Pack, BC-W126 Battery Charger, Body Cap for Fujifilm X-Mount Cameras, Shoulder Strap, Metal Strap Clip, Clip Attaching Tool, Protective Cover. Deluxe Photo Bundle Includes: 2 x 32GB SD Card, 0.43x High Definition Wide Angle Lens, 2.2x High Definition Tele Lens, 3 Piece Filter Kit (Ultraviolet (UV) Filter/ Circular Polarizer (CPL) Filter/ Fluorescent (FL-D) Filter), Hand Strap, Slave Flash, Camera Shoulder Bag, 3 Section 59″ Tripod (with case), UV Filter, Fiber Cloth, 3Pc Cleaning Kit, 2 Screen Protectors, Dust Blower, Lens Cleaning Pen and Memory Card Case. Camera Specs: 24.3MP APS-C X-Trans CMOS III Sensor, X-Processor Pro Image Processor, 2.36m-Dot Electronic Viewfinder, 3.0″ 1.04m-Dot Tilting Touchscreen LCD, UHD 4K Video Recording at 30p, Built-In Wi-Fi, Extended ISO 51200, Shooting to 14 fps, 91-Point AF with Custom AF-C Settings, Film Simulation for Photos and Videos, Fujinon XC 16-50mm f/3.5-5.6 OIS II Lens.